The conference will be held in the Auditorium of Acquario Civico of Milano. 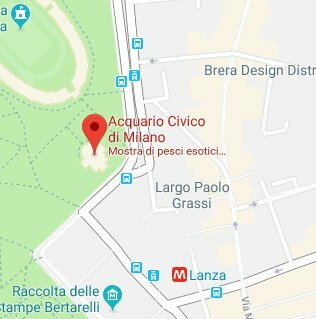 Located in the area of the Parco Sempione, between the Civic Arena and the Castello Sforzesco, in the center of Milano. Find routes and timetables from Azienda Trasporti Milanesi site. The "Acquario Civico" is 2 just minutes walk from the Lanza underground station (green line, see the interactive map above). if you land in Milan Malpensa, you can take the Malpensa Express to Milano Cadorna, and then catch the underground (M2, green line) to Lanza station. if you land in Milan Linate, you can take the shuttle to Milano Centrale and then catch the underground (M2, green line) to Lanza station. if you land in Milan Bergamo Orio al Serio, you can take the shuttle to Milano Centrale, and then catch the underground (M2, green line) to Lanza station. If you arrive by train (Milano Centrale), you can take the underground (M2, green line) to Lanza station. The location of the event is in Milan Downtown, in Brera district where the historical site of the Brera Astronomical Observatory is located. There are many accommodation alternatives in this beautiful area and a selection of hotels can be found at this link. Lunch will not be provided by the organizers. However, the conference will be held in a very central spot of the city, with plenty of choice among nearby restaurants and pizzerie (see the map here). Palazzo Brera is the site of INAF Astronomical Observatory of Milan and of the Pinacoteca (Gallery of Fine Arts), the Accademia (School of Fine Arts), the Braidense National Library and the Botanical Garden. If you wish to receive further information, please send an email to agn13_loc@brera.inaf.it.